Informal articles, reviews, experiences, and general enlightenment into the world of Japanese whisky. The Akkeshi Distillery project team are pleased to announce the long awaited renewal of the official homepage that went viral today on October 3, 2016. The inaugural distillery homepage was launched last year, back in August, but today’s new site has had minor design changes for better visibility, and there is an abundance of new information available with spectacular pictures. 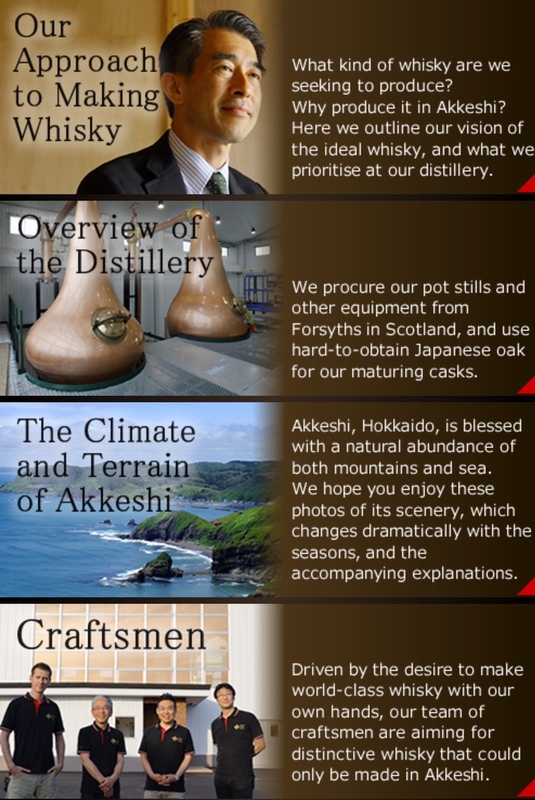 Without spoiling the experience take a look for yourselves - visit the Akkeshi Distillery homepage and join in on the new epoch of Japanese whisky. The homepage is fortunate to be available in both English and Japanese. Nose: Straight off the rim of the glass you get an array of fruits including coconut sticky rice with sliced mango (Thailand desert), sliced banana soaked in rich tin fruit salad syrup, dried apricots and baked pear, and without doubt stewed apples with a touch of clove. Vanilla soft chewy candy. Mellow hints of soft liquorice sticks. Pencil shavings. The most delicate hint of peat. Fruity chewing gum (Juicy Fruit). Wood varnish develops with a bit time along with a grassiness. Taste: Thin and reasonably mild-to-light, a tad tangy with a touch of menthol before going straight-up dry. Outside the dryness you get mostly stewed apples with cloves (clove ratio to apple is out weighing – mellow spice). Subtle hints of liquorice. Then, dried apricots and dried orange peel. Perhaps a little less estery here than the nose. If only there was a bit more going on the palate. Finish: Dry. Not a huge change from the taste with the same elements of subtle liquorice, dried apricots, cloves and apple, followed by dried orange peel and grassiness. Walnuts on the last leg. Comment: This vatted malt would most likely have been a stellar whisky if the palate showed a bit more potential as did the nose. Still, very enjoyable, and most suitable for warm weather. Interestingly this reminded me of a few other Japanese whiskies I’ve had before from different distilleries. Note: The Kirin Fuji-Gotemba distillery began operating from 1973. 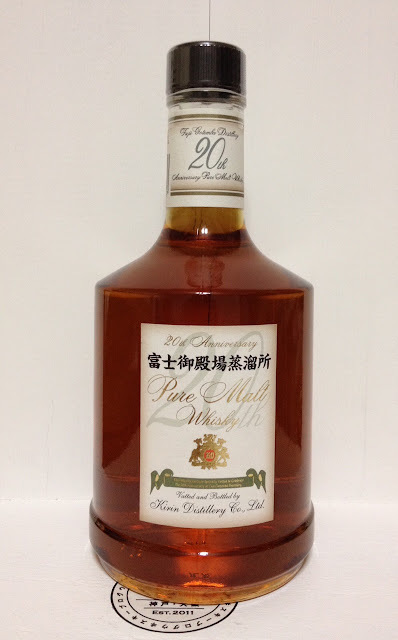 The release of this pure malt (vatted malt) in 1993 was to commemorate the distillery’s 20th anniversary. According to various sites, including Kirin, some malt parcels contained in this blend were distilled in commonly used continuous stills. 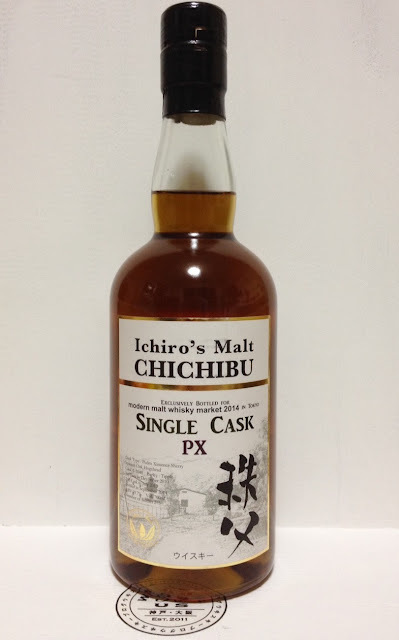 This whisky was/is perceived as a limited release but from what I was told and can see it is still available at the distillery and on-line at an RRP of 3,240 yen (including tax)…silly me for paying too much for it on the second hand market! Taste: Naturally the earthy peat and charcoal ash is relatively dominant. But there is more to it. Smouldering cigar leaf, PVC toys, spicy citrus BBQ sauce, and the lemon Strepsils are back. Thai basil. Perhaps one of my favourite tastes on the pallet is the unmistakable mouth coating flavour of Porky Bits (pork crackling cracker snacks). With water salted pistachio and ash baked potato skins. However, a little too much water can make this go a bit dry. Finish: Maintains a reasonable ride with Thai basil, pork crackling snacks, and ash dust from baked potato skins. With water, again, salted pistachios. 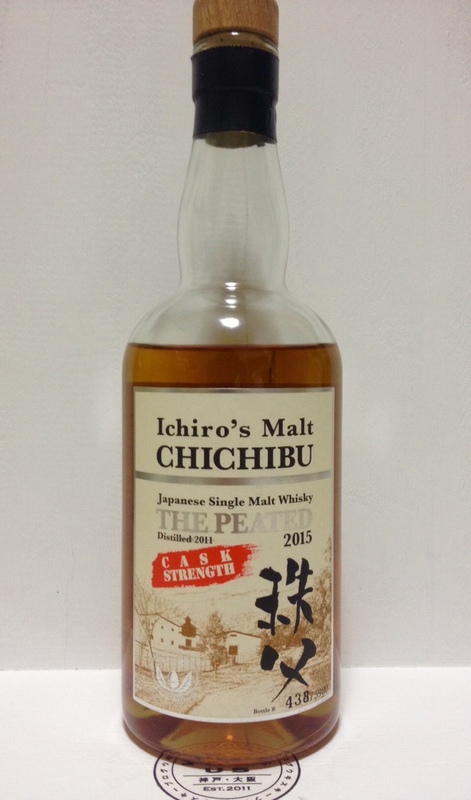 Comment: The 2015 edition is the 3rd release of Chichibu’s ‘peated expressions’. All 3 limited releases maintain their own uniqueness and subtle characteristics that I liked so I’d be hard pressed to nominate a favourite. If pressed I’d most likely reveal however which one I’d lean to the most. Nose: Strawberries and cream soft chewy lollies. Earl grey tea fruit cake, lemon and honey tea, maraschino cherry and/or black forest cherry sauce. Soft tonnes of fresh licorice sticks. Late arrival on sourness. With water golden brown toasted raisin bread with a smear of butter, strawberry wafer biscuits, and Umeshu. Sweet and sour sauce. Hints of vermouth at times with fragrant orange. Taste: To begin with it is hot. Then it moves expressively to spicy grilled figs, pink pepper corns, dry sherry - more so than PX, and Rocky road. Time in the glass works well with this Chichibu, which allows further development of menthol, earl grey tea, and spicy lemon peel. With water this malt has a lot more riding - berry marmalade, a touch of star anise, and mint leaves lollies. If you can be extra patient and let it sit after dilution you get a lovely liquid herb combo (again Vermouth?) and a hint of eucalyptus honey. Finish: Moderate to long. Menthol spices, a touch of licorice, raspberry spicy sauce, dry sherry, dried orange peel, and marmalade. Dry. Water loosens up the dryness and takes a notch of the spicyness. Comment: To date with what I own and have opened this is one of my favourite single casks from a handful of Chichibu's. Have yet to open the Oloroso. 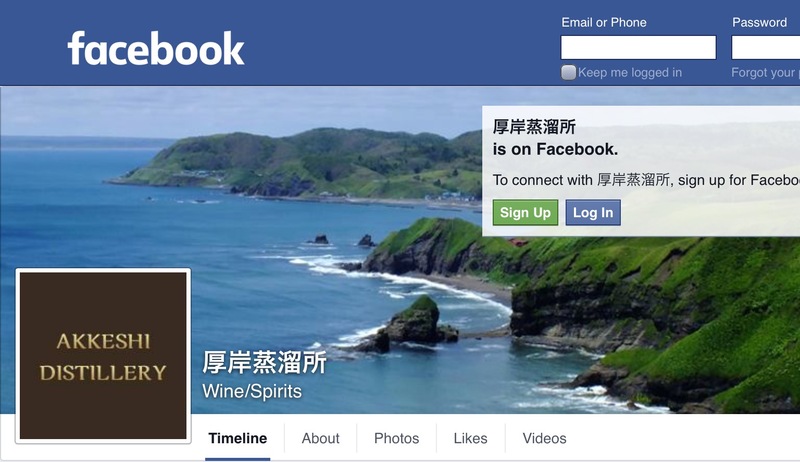 Kenten Co. Ltd, the owners of the upcoming Akkeshi Distillery in Hokkaido, has created an official Facebook page https://www.facebook.com/akkeshi.distillery, as a platform to communicate with potential fans, and to provide an additional scope into the birth of their distillery-in-progress. From today onward (September 1, 2015 – 12:00pm JST), Japanese whisky enthusiasts will be able to follow the fruitful efforts of the people responsible for one of Japan’s newest proposed distilleries, and find out about the latest developments of the distillery as they happen. Take a look at the Akkeshi Distillery’s recently developed website, and keep an eye on their Facebook page for highlights. 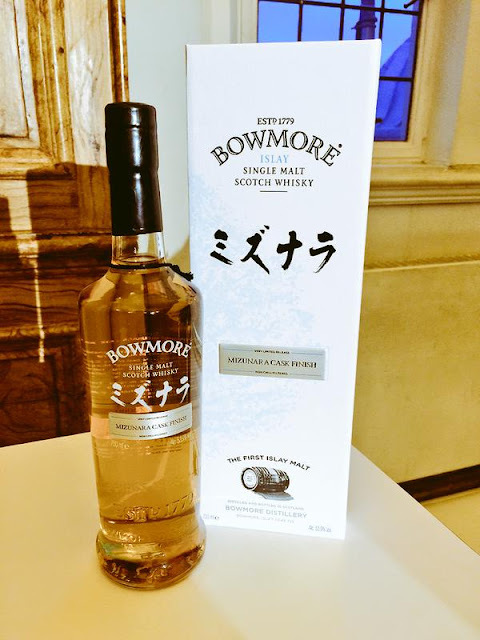 'Whisky for Everyone' has recently tweeted from the live launch of Bowmore's Mizunara Cask Finish. According to their tweet the limited edition Bowmore has an outturn of 2000 bottles and will retail at 750 pounds per bottle. In addition The Spirits Business have informed their followers with a tweet that the make up of this good looking package is from bourbon and sherry cask parcels respectively, and with a 3 year finish in Japanese Oak. The abv of this whisky, which I presume will be highly sought after, regardless of the hefty price tag, comes in at 53.9%. At this stage there are mixed answers given as to whether this release will be available in Japan, regardless of ownership. This would be unfortunate for local whisky enthusiasts if it didn't make it ashore however, fortunate for others as it would mean a greater opportunity for availability. UPDATE August 20th, 2015: The Spirits Business last night revealed that in fact Japan will receive an allotment. For additional information regarding this release check out their full article (here). Japan, August 10, 2015. Kenten.Co Ltd, the founding company and owner of one of the nation’s newest and upcoming distilleries, launched an inaugural distillery website. The new site that went live this afternoon gives an invaluable insight into the preestablishment of the Akkeshi Distillery that is a work-in-progress. The informative homepage, which is fortunately accessible both in Japanese and English, documents the birth of a ‘new era’ Japanese whisky distillery. The distillery, which was born out of one man’s dream, is significantly situated in Hokkaido, the northernmost of Japan’s islands and is located in the town of Akkeshi, a sub-prefecture of Kushiro. The new Internet site is divided into sections: who they are and what they are aiming to do, their vision, the region, and the distillery’s character. As with the progression of the distillery Japanese whisky enthusiasts can expect to see the continuing development of the Akkeshi Distillery web portal to flourish. Keep your eyes out for the announcement of the Akkeshi Distillery Facebook page that will follow in due time. Be sure to like the page and invite your friends. 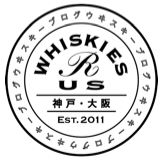 Whiskies R Us is an informal Japanese whisky blog written by an individual, based in Japan, who strongly shares the enthusiasm and interest of Japanese whisky. The aim is to simply share information and personal experiences with whisky gained throughout a continuing journey. Content will explore the Japanese whisky industry including independent whisky reviews, as well as whisky retailers, and bar introductions within the Kobe, Osaka, and Kyoto areas. © 2011 Whiskies R Us. Simple theme. Powered by Blogger.